Post the laudable success of Irudhi Suttru, Madhavan is back with a bang indeed. Fans are going crazy over his angry and hunky makeover as a coach in the venture. 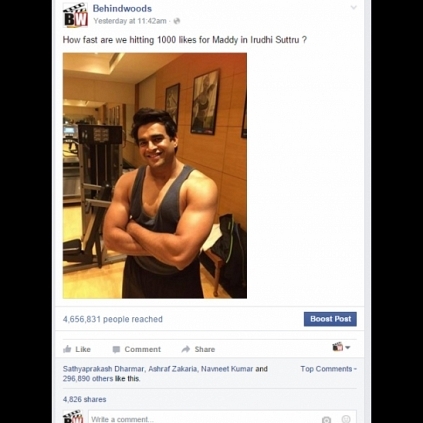 How fast are we hitting 1000 likes for Maddy in Irudhi Suttru ? This post went viral over-night and garnered a lot of attention with a reach of close 50 lakhs. 5000 comments in the image with much love and praises for his performance in the venture. Thank you so very much again from the bottom of my heart to all at Behindwoods. in every phase of his life! Akshay just made Rajini's 2.0 bigger? Director Muthaiah Clarifies That He Has No Facebook Or Twitter Account. People looking for online information on Behindwoods, Facebook, Madhavan will find this news story useful.